The OHL Classic at Mayakoba could be the event that ends the long wait for Briny Baird, the PGA Tour’s richest golfer not to win a tournament, to break through for his first victory. The son of a professional golfer, Baird turned professional in 1995 and he has finished second in no fewer than PGA Tour events, including when losing to Bryce Molder on the sixth extra hole of the Frys.com Open two years ago. Bookmakers are aware of Baird’s long winless streak and that is why they are offering long odds about him winning the OHL Classic at Mayakoba in spite of his excellent numbers. Baird has played in every edition of the OHL Classic at Mayakoba, finishing 63rd in its inaugural year but posting results of 12th, sixth, fourth, fifth and 12th subsequently so his course form is as formidable as anyone in this year’s field. Plus Baird was second in The McGladrey Classic last week, ending up one stroke adrift of Chris Kirk. A lot will depend upon how Baird handles the disappointment of handing The McGladrey Classic title to Kirk but the American is no stranger to close misses so there are grounds for thinking that he will perform more than adequately this week. Bet365 are offering odds of 51.00 about Baird winning the OHL Classic at Mayakoba. Baird’s course and recent form figures entitle him to be half those odds but one is getting a spoil because of his nought-for-365 record. Obviously, it does not make sense to bet the house on Baird but he does hold some appeal at odds of 51.00 given some of his data. Coral has paired Baird with Brian Harman in an OHL Classic at Mayakoba match bet and it is inviting punters to choose between the two golfers at odds of 1.91. Harman made the top 10 in The McGladrey Classic last week but it was on his home patch as he lives in Sea Island. Harman has competed in the OHL Classic at Mayakoba only once and he finished 26th. One cannot trust Baird implicitly but he does deserve to be the favourite against Harman, probably at odds of around 1.70. Brian Gay is another golfer for the OHL Classic at Mayakoba short list. Gay won the 2008 edition of the tournament and he was fifth in 2011. Gay finished fourth in The McGladrey Classic so he will arrive at one of his favourite venues in good mental shape, which means that Bwin are going to do business at odds of 41.00. Coral has chosen to put Luke Guthrie and Gay together in an OHL Classic at Mayakoba match bet. Guthrie is an OHL Classic at Mayakoba debutant and he came crashing back down to Earth in The McGladrey Classic when he missed the cut having been a top-five finisher on each of his previous two PGA Tour starts. Backing Gay at odds of 1.91 makes a lot of sense. Finally, The McGladrey Classic roughie Matt Every landed odds of 8.00 when finishing in the top 10 last week and he well worth following in the OHL Classic at Mayakoba as well. 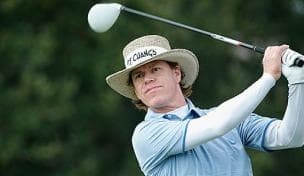 Every was disqualified for the 2010 edition of the only PGA Tour event in Mexico but his other appearance was last year and he placed third behind John Huh. Bookmakers have wised up to Every and odds of 31.00 with 888sport and Unibet are the best available about him winning the OHL Classic at Mayakoba but the field is not the best so he is a chance. Every is in one of Coral’s OHL Classic at Mayakoba match bets with Charley Hoffman, whose numbers do not stack up well. Hoffman was 69th in the 2012 OHL Classic at Mayakoba and he was 22nd in The McGladrey Classic last week. Odds of 1.91 about Every beating Hoffman are more than acceptable.